Today I want to talk about a management team and how it relates to employees. Imagine the management team. They are in charge of the project of evaluating the performance of their collective employees. In some organizations, they are asked to “stack rank” all employees in an organization, or at least put them in general categories, such as low performer, average performer, high performer, or some variation like, “Needs improvement” at the bottom of the rank to “High Potential” at the top of the rank. OK, now the management team needs to do the work of ranking the employees. The person facilitating this process is likely to be the manager of the team of managers, or the manager above that. So you have a bunch of managers in a room discussing a large batch of employees’ performance, making arguments about who is a good performer, who is an average performer and who is a low performer. Oftentimes there is a forced curve that requires some people into the “needs improvement” bucket. Oftentimes these discussions have promotion implications and bonus implications. In the examples of companies that have adopted the “fire the lowest 10%” philosophy, it also has firing implications. Inevitably, the employees know that this kind of thing is happening between the managers. This is a common practice at many large organizations, and a tough one to get right. I’m not really sure it is possible to get right, and here’s why. In a discussion like this, each manager is armed with some data about the employee. As discussed frequently in this blog, that data about how an employee performed is limited at best, and non-existent at worst. There are cases where there are specific metrics that are directly comparable across employees, and a certain amount of fairness can be achieved by this measure. 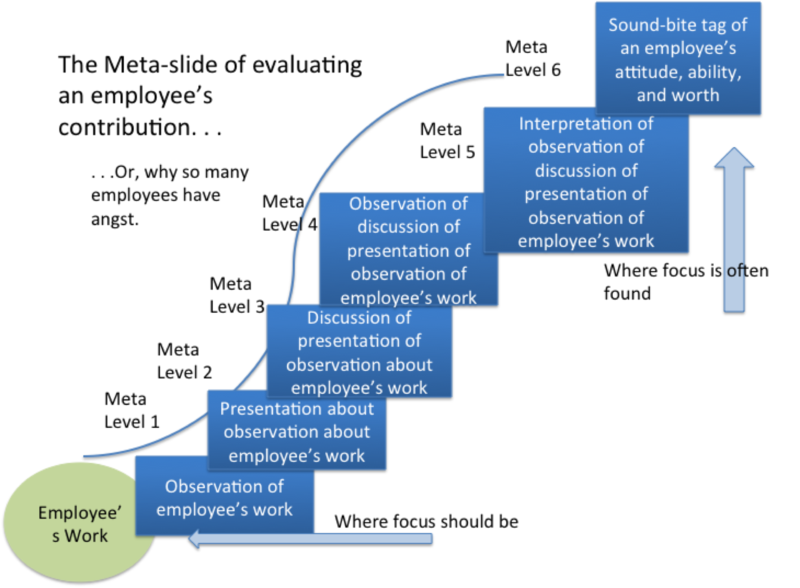 This typically occurs with employees at the lower level of an organization, and if you have several employees doing similar or repetitive work that produces comparable metrics. This is decreasingly the case, however, as even – or especially — entry-level positions require more quality-minded, customer-oriented, problem-solving type thinking to achieve high-pressure work goals. So even when there are directly comparable metrics, there are many intangibles that come into play. So inevitably, it seems that current management design requires that managers get in a room and essentially argue who is the best employee, whether they deserve a raise, and, in many cases, argue that the other employees are less deserving. Now, what’s tough is that these decisions are way out of the employee’s control – even if they have done amazing work through the year.